Special Edition: The only Sibley 400 Ultimate with an integrated mesh door! Loaded with features to adapt to changing weather and super easy to set up, The Sibley 400 Ultimate is the ideal bell tent for 2-4 people and 3 season camping. The 400 Packs down small enough to fit in a standard car trunk, yet measures 4 meters (13ft 1in) in diameter with 12,5 m² (134 ft²) of floor space once pitched. All Ultimate tents have zip in/out bath tub style groundsheets so you can roll up the side walls, or remove the floor entirely if you choose. Made with our waterproof and breathable Classic Canvas (320 gr/m² or 9.5 oz/yd²); thoughtfully engineered for camping with ease, comfort, and style. We took the classic bell tent design and packed it with features focusing on ease of use, comfort, style, and versatility. 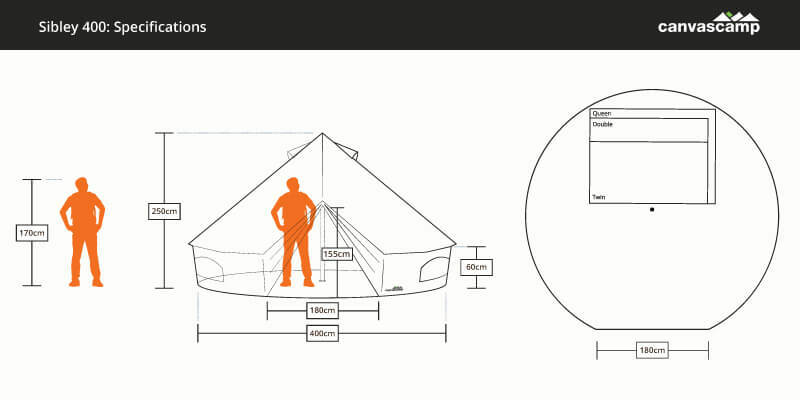 The Ultimate checks all the boxes for family camping, luxury camps, casual glamping, festivals, garden parties, car camping, back yard lounging, and 3 season use. The rip-stop, water and vapor impermeable groundsheet attaches to the tent with a burly size 10 zipper that runs a full 360 degrees around the perimeter. Giving you the ability to roll up the canvas side walls and let the breeze in, or remove the floor completely for transport, cleaning, storage, or to feel the grass between your toes! Our Ultimate groundsheets attach to the tent with a zipper and are made of durable, thermally welded, PVC (540 gr/m² or 15.93 oz/yd²). Completely water and vapor impenetrable, the ‘bathtub style’ floor rises 4 inches high to keep you dry even in standing water. Using a heavy duty size 10 zipper to attach the sidewall to the groundsheet, you can unzip the floor to roll up the canvas walls for maximum ventilation, or remove the groundsheet entirely for transport, storage, cleaning, or to enjoy the grass or sand beneath your feet. A tail gate style system of secure hooks and loops allows you to drop the bathtub wall near the door and peg it flat to prevent tripping and facilitate easy cleaning. The poles on the Ultimate SE series have been beefed up from the standard poles included with the Standard, Deluxe, and Ultimate Series. The Ultimate SE comes with PRO grade poles: door poles are 23mm (.91 inch) and the center pole is 32mm (1.25 inches) in diameter. Internal spring loaded wires guide the pole sections together for quick and easy assembly. The center pole has a welded lanyard ring which can be used to hang an inner tent or chandelier. The Sibley 400 Ultimate SE includes a sewn in no-see-um mesh door in addition to the traditional canvas door. 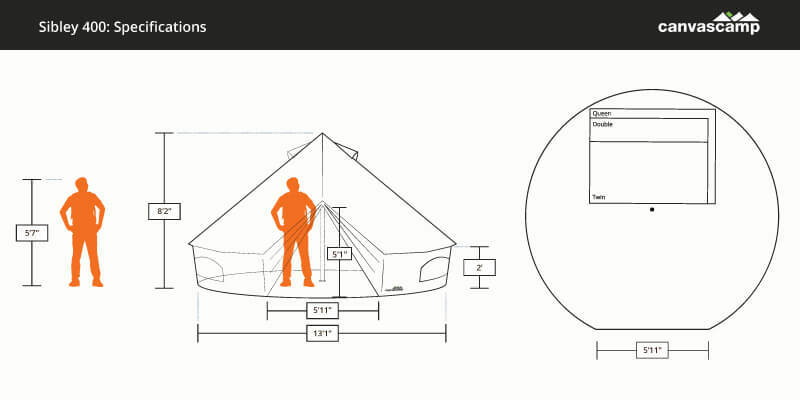 The tent is equipped with loops on either side of the door to neatly tie back the mesh door when not in use. Our Ultimate series comes with 3mm guy ropes that will need to be tied on before your first pitch. Check out our assembly instructions at the top of this page to get a feel for the initial set up process. Our PRO Series comes with pre-attached guy lines and tensioners for those customers looking for an out-of-the-box set up. Plastic tensioners prevent edges from cutting into the guy lines and prolong the life of your tent.